The Longevity Diet: Learn How you Can Live Long and Feel Great! The longevity diet is exciting as there are so many vibrantly colorful, amazingly delicious natural foods to choose from that promote health and well being. A diet for a long, healthy life consists largely of fresh, organic fruits and vegetables, sprouts, raw nuts and seeds, sea vegetables, unrefined oils and some sprouted grains. 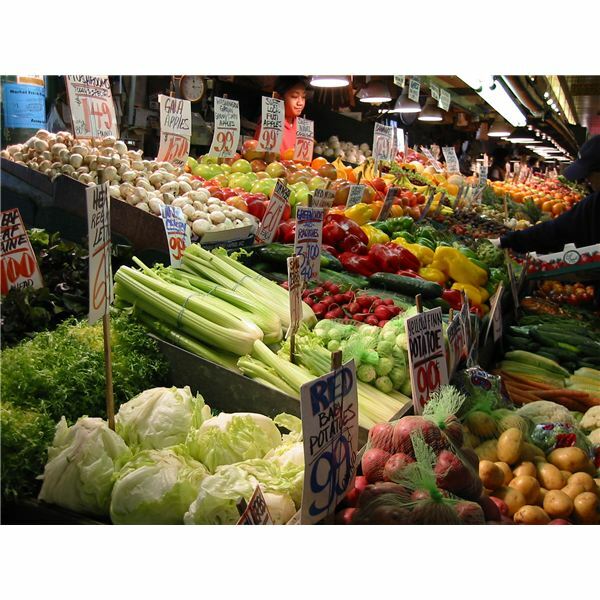 This may seem so limiting at first glance but just looking at the picture I have included of a fruit and vegetable stand, we are reminded how many amazing choices we have been given for eating a very healthy, cleansing diet. Green Smoothies: This is one way to sneak a lot of extra leafy green vegetables into your diet. Be careful not to put high sugar content fruits in this smoothie every day or you will gain weight and not feel as healthy. Green Juices: Green juices are very low to non-glycemic and safe for diabetics. These are freshly made from vegetables such as kale, spinach, cucumber, parsley, sprouts, lemon and ginger. It is important to do regular green juice fasting. According to Paavo Airola, PhD, ND, "Disease and aging begins when the normal process of cell regeneration and rebuilding slows down. This slowdown is caused by the accumulation of waste products in the tissues which interferes with the nourishment and oxygenation of the cells." Fasting is one to cleanse the body of toxins quickly and efficiently. A Big Green Salad Loaded with Sprouts. Every day make it your goal to include a big green salad with homemade salad dressing and lots of sprouts. You can also top it with raw hemp seeds, organic olives, raw cracker pieces, avocado and a dressing such as lemon tahini dressing or any healthy raw salad dressing. Good oils to use include flax, hemp, olive, sesame, almond, sunflower and coconut oil. All oils should be unrefined and cold pressed. Probiotics: These are live, healthy, good bacteria that your colon needs in order to kill off the bad bacteria, parasites, viruses and toxic waste that reside there. A great and inexpensive way to add these to your longevity program is by including cultured foods and beverages in your diet. These include raw, unpasteurized kefir, kimchi, kombucha and sauerkraut. Consume these foods with every meal. They will assist in the digestion of all foods they are consumed with especially proteins and starches. Enzymes: These are involved in every metabolic process in the body. They are necessary for life. We are only born with a certain amount of enzymes stores. When we eat dead foods, our body has to spend great amounts of time and energy manufacturing enzymes to digest the dead foods. Taking digestive enzymes or eating cultured foods with every meal greatly enhances nutrient absorption from our food and promotes longevity. Green Foods: These inlude chlorophyll rich foods such as chlorella, spirulina and blue-green algae. These are chlorophyll rich foods that greatly enhance our health and promote a long, healthy life. Caloric Restriction: According to a report in Life Extension Magazine in 2007, "Dr. Spindler and his colleagues, in their findings on caloric restrictions showed in 2004 that caloric restriction acts rapidly, even in old mice, to extend remaining lifespan by 42 percent and to dramatically reduce tumors as a cause of death. They found that gene expression also changes rapidly to a new pattern that is closely associated with lower cancer mortality and better health." Implementing the ideas presented here for the longevity diet are effective means to improve health and overall wellness for long life.